I know to non-city-dwellers the idea of eating food out of the side of someone’s truck sounds less than appealing. You’re thinking greasy falafel and dirty water hot dogs. Think again. In recent years, the Food Trucks of NYC have turned into big business for small-time gourmet food purveyors. You can get some awesome food from a truck these days. There’s one called Wafels & Dinges (a Belgian waffle truck) which makes a “Bacon Syrup Waffle.” The bacon and the syrup are INSIDE the waffle. I had to figure out how to get the bacon and the syrup into a waffle for the big brunch party… So, I went to the internet, and I found my new favorite food blog: Joy the Baker. Joy knows how to get to the bacon in the waffle. So I followed her recipe for Brown Sugar Bacon Waffles with one little tweak (she got the bacon in, but not the syrup). I had to make them the night before the party (I doubled this recipe), and when I tasted the first one out of the iron, I found my new favorite breakfast. Give them a try this weekend, and check out Joy’s other recipes. So many of them look soooo delicious. If this one is any indication of the quality and creativity of Joy’s recipes, you’re in for a real treat. Serve with maple syrup and strawberries. Preheat oven to 375 degrees F. Spray a baking sheet with non stick cooking spray and line with foil. *I used parchment paper* Arrange bacon in a single layer on the baking sheet. Sprinkle generously with brown sugar. Place in the upper third of the oven and bake until sugar is caramelized and bacon is brown and crispy, about 10 to 15 minutes. Remove from oven. Immediately remove bacon slices using a pair of tongs. Place them on a cutting board (not paper towels, they’ll stick!) to cool before chopping. DRIZZLE the warm bacon with maple syrup. Once cool, chop the bacon into bite size bits and set aside. 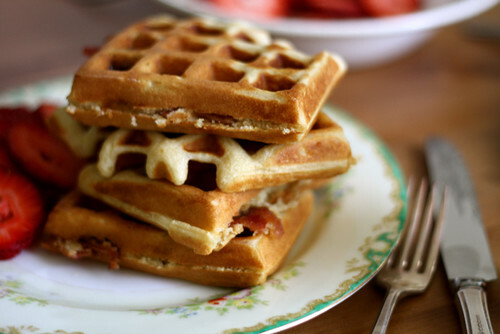 *If you don’t eat bacon for some reason, try adding 1/4 teaspoon nutmeg and 3/4 teaspoon cinnamon to the batter. Yum! Set up your waffle iron on a level, clean surface and turn on to preheat. In a large bowl combine flour, baking powder, baking soda, salt and brown sugar. Whisk to blend. In a medium bowl, whisk together eggs, oil, buttermilk and vanilla extract. Add the wet ingredients to the dry ingredients and fold. Once almost fully incorporated, add the bacon bites. Stir. Try not to over mix the batter or the waffles will become tough. It’s ok if a few lumps remain in the batter. These were a big hit at the party. I cut them in half and served them at room temperature as ‘finger food’ with some syrup on the side for dunking. But I think we all enjoyed them most as leftovers. If you have any (maybe you want to make a double batch, too, so you do…), pop them in your toaster the next day. They’ll crisp up and be just as “Joy”ful a treat.